The use of “Rule of Fraction” is dominant. We should understand this rule very well because it is going to be used in almost all the questions. fraction which is more than one. And if our required value is less than the supplied value we should multiply the supplied value with a fraction which is less than one. 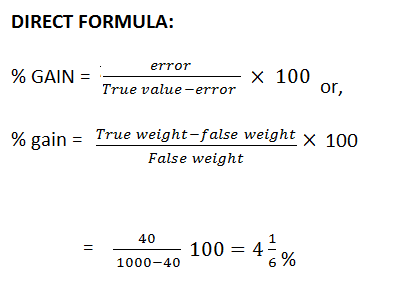 If there is a gain of x%, the calculating figure would be 100 and (100 + x). If there is loss of y%,the calculating figure would be 100 and (100 – x). If the required value is more than the supplied value, our multiplying fractions should be (100+x)/100 or 100/(100-y) ( both are greater than 1). If the required value is less than the supplied value, our multiplying fractions should be 100/(100+x) or (100-y)/100 (both are less than 1). 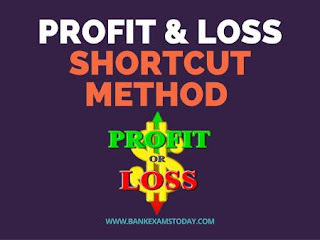 The profit or loss is generally reckoned as so much per cent on the cost. Ques - A man buys a toy for Rs 25 and sells it for Rs 30. Find his gain per cent. Ques - A boy buys a pen for Rs 25 and sells it for Rs. 20. Find his loss per cent. Ques - If a man purchase 11 oranges for Rs. 10 and sells 10 oranges for Rs 11. How much profit or loss does he make? Solution: Suppose that the person bought 11 x 10 = 110 oranges. Ques - A man purchases 8 pens for Rs 9 and sells 9 pens for rupees 8. How much profit or loss does he make? Ques - A dishonest dealer professes to sell his goods at cost price, but he uses a weight of 960 gm for the kg weight. Find his gain per cent. Solution: Suppose goods cost the dealer Re 1 per kg. He sells for Rs 1 what cost him Rs. 0.96.